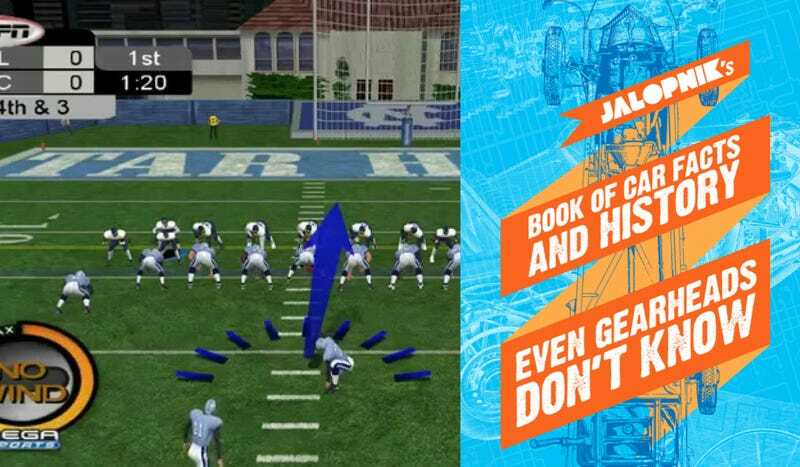 Why Buy NCAA Football 2K3 For PS2 When You Can Get The Jalopnik eBook? Sure, the 2003 NCAA Div-1 Football season was pretty spectacular, but would you really rather have NCAA College Football 2003 for PS2 instead of the Jalopnik Book Of Car Facts And History Even Gearheads Don’t Know? And, the Jalopnik eBook is like $0.36 cheaper and doesn’t require a Ps2. I’ll grant you that 2003 is the year I’d most like to see a do-over for as a college football fan. Oklahoma couldn’t even beat Kansas State at the end of the year, dooming a Texas team to the Holiday Bowl (which we lost). LSU rightfully won the national championship, but AP voters chose USC anyway (a decision that looks hilarious in retrospect). So, you could buy the game, and re-live sacking Matt Leinart, which isn’t a bad way to spend an afternoon. Or you could buy our book, which I promise you is almost entirely devoid of Matt Leinart. Also, the people who wrote our book got paid, unlike most of the college athletes being represented in the game (Reggie Bush aside).